This tutorial was written on June 10th, 2018 for the official Vue.js documentation site. However, as of August 7th, 2018, it is still pending review so the tutorial has been shared here too. What if you could build a cross platform desktop app with Vue? You can with Electron. Electron enables developers to use web technologies to build cross platform desktop apps. It accomplishes this by "combining Chromium and Node into a single runtime and apps can be packaged for Mac, Windows, and Linux". This enables us to use Vue for building the UI of a desktop app and gives us access to Node and Electron APIs within our apps. Let's get started and we'll explain more things as we go. First, you'll need to install vue-cli. Next, we're going to set up our project with a pre-existing Electron + Vue template. Please read this whole paragraph before proceeding. During the set up process, you'll be asked a series of questions to help you set up. When asked which Vue plugins to install; please choose vue-electron (we won't need the other options). You'll also be asked which build tool you would like to use; please choose electron-builder. We won't need anything else so if you're asked about ESLint or testing, you can say no to those (but you may want to use them in future projects). The vue-electron plugin makes Electron's APIs available for use within our Vue components. We'll use electron-builder to package our application into executables for Windows, Mac, and Linux. We'll be writing Vue code in the src/renderer/ folder. Note that there are two folders within the src/ folder: main and renderer. Electron apps run two types of processes: main and renderer. The renderer processes are responsible for rendering the webpages (the user interface) and the main process is responsible for everything else such as managing the renderer processes, setting the window size, and setting the window's menu options. Both processes correspond to the code written in each of their respective folders. Since we'll be writing Vue code in the renderer/ folder, our Vue instances will be running on a renderer process. Node and Electron APIs are accessible from the renderer processes. Imagine a browser with access to operating system APIs and you've got an Electron application. In this tutorial, we'll be working mostly inside the src/renderer/ folder. You can read more about the main and renderer processes at Electron's documentation. Let's start by building a simple timer in Vue. Checkout the src/renderer/ folder's contents. The directory structure is similar to the directory structure of projects using Vue's Single File Components. Remove the src/renderer/components/ folder and it's contents. Our timer looks weird because the minutes and seconds are single digits. We can fix this by adding a computed property that adds zero padding to the minutes and seconds. Make the changes indicated in the comments below. Now our timer looks better. Next, let's add a start and reset button for our timer. Make the changes indicated in the comments below. Now you should be able to start and reset the timer. You might notice the timer counts down faster when you click Start several times while the timer is already running. To avoid this from happening, let's disable the Start button when the timer is already running. We'll add a variable called running which will represent the state of the timer and use that variable to disable the Start button while the timer is running. Make the necessary changes indicated in the comments below. Next, let's add buttons for setting the timer's default value. We'll need to add variables for the default minutes and seconds too. When we click the Reset button, our timer will set itself to the default minutes and seconds variables. Make the changes indicated in the comments below. We've built a desktop app for a timer with Electron and Vue. But it doesn't use desktop-only features like reading/writing to files or sending desktop notifications. We also haven't made an executable for our desktop app; it only runs when we run npm run dev. In the next section we'll incorporate desktop-only features. We'll build an executable for our app when we are done building the app's functionalities. We've built a desktop app for a timer with Electron and Vue but we haven't used desktop-only features. In this section, we'll use APIs from Node and Electron to bring desktop features. We'll use the os and fs modules from Node to read/write to files and HTML5 notifications from Electron to send desktop notifications. We'll use Node's os and fs modules to read and write to a file on the user's computer so we can load the previous timer's settings when the user loads the application. First, we'll need to import Node's os and fs modules. We'll save the user's settings in a file called .vue_electron_timer which will be located in the user's home directory. The user's home directory path is different for Linux, MacOS, and Windows so we use the homedir() from Node's os module to get the home directory across all platforms. On Windows, the home directory is usually C:\Users\your_username. On MacOS, the home directory is usually /Users/your_username. On Linux, the home directory is usually ~ or /home/your_username. Create a variable that contains the path to our settings file. We'll use path_to_settings to read and write to the timer's settings file. Whenever the user clicks Start, we'll save their timer's start time. For example, if the user sets their timer to 5:00 and clicks start, then we'll save 5 minutes and 0 seconds to the timer's save file so the next time the user opens the application, they'll start with a timer set to 5:00. We can save the user's start time by using the writeFile function from Node's fs module to write to a file. When the Vue instance is mounted, we'll load the default values from the file then load the values into the right variables to be used by our app. We can use the existsSync function from Node's fs module to check if a file exists. If it exists, then we'll load the data from the save file by using readFileSync. If the file doesn't exist, then the user is opening our application for the first time and nothing needs to be done (the timer's default value will be based on the initial values in the Vue instance's data() function). Add the following mounted function to the Vue component. Checkout the Vue Lifecycle Diagram to see when a Vue instance is mounted. Test your timer. Set it to 12:00, click start, close the app, run npm run dev, and your timer should be set to 12:00 by default. body: "And a longer subtitle for the notification"
Whenever the timer hits zero (0:00) we'll send a notification. Let's add a notification to our App.vue's countdown method. body: "Woo hoo! A desktop notification!" Test out your timer. When your timer hits zero, you should get a desktop notification. Our timer is is a tad ugly. To see the changes to our CSS, you may need to refresh the window by using CTRL + R.
You can still bring up devtools by using CTRL + Shift + I. So far we've been running our desktop app using npm run dev which starts a local server and rerenders our application on changes. Let's build an executable so we can share our app with others and actually install it on to our system like we do with desktop apps. To build the executable, run npm run build within timer/. It can take a while to build the executables for Windows/MacOS/Linux. The executables will be located in timer/build/. Once the npm run build is done, you should see your platform's, and possibly another platform's, executable. For Windows this is a .exe file and for MacOS it is a .AppImage file. 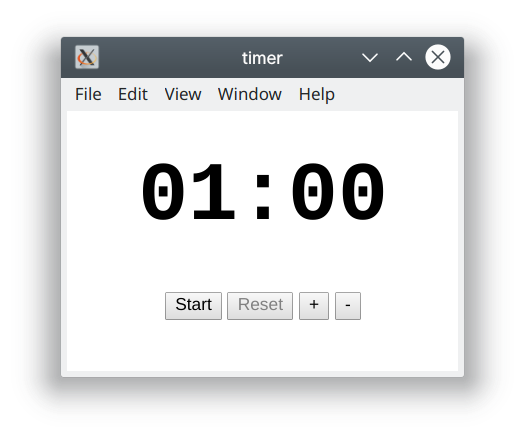 For Linux, the executable's name is the project name with no extension, so it would be timer for our example. We finished building a timer in Electron and Vue. Writing a cross platform desktop app with Electron and Vue app is similar to writing a regular Vue application with Single File Components but with additional APIs from Node and Electron. Writing a desktop app with Electron and Vue is convenient for web developers. It enables web developers to leverage their prior knowledge and experience. 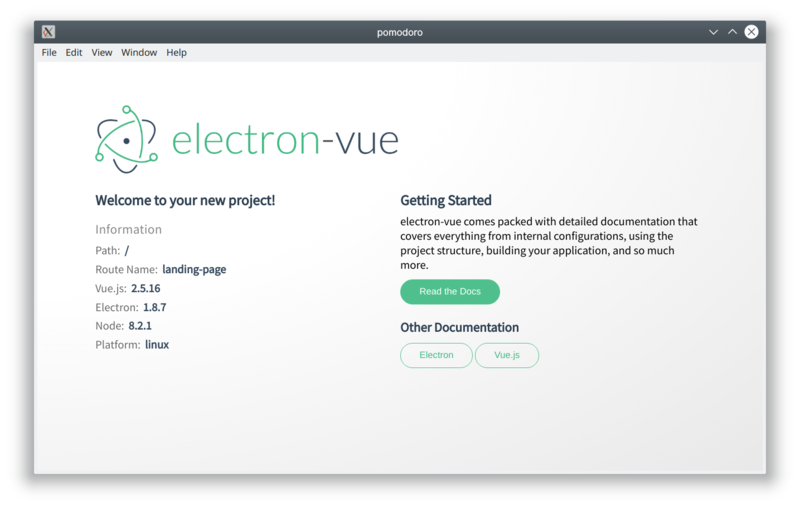 You can explore Electron's documentation and electron-vue's documentation to build more complex Electron and Vue applications. Electron applications tend to have larger build sizes and require more resources when compared to their native counterparts written in their respective operating systems' preferred language(s) and framework(s). This is because Electron bundles it's own version of Chromium, a browser, with your application. It doesn't matter if your system already has Chromium. Each Electron application comes with it's own browser. If the performance and size of an application take priority over the convenience of using web technologies, then avoid building applications with Electron. There's an alternative to building cross platform desktop apps with Vue: vuido. According to it's documentation, it's still in early stage development. You can also build cross platform desktop apps, without Vue, using either Qt or Proton Native. Vuido, Qt, and Proton Native offer better performance and smaller app sizes than apps built with Electron. You can build desktop apps in each operating systems preferred language and framework too. This usually translates to maintaining three codebases with similar function and form but usually reaps the best performance and smallest application size.